To say that traffic is very congested in Washington, D.C. is an understatement. To get around the city, you must have patience and a good sense of direction. Street parking is hard to find and most garages charge $5 an hour or $20 per day. For the newcomer, finding your way around can be very confusing. The city is divided into quadrants — Northeast (NE), Northwest (NW), Southeast (SE) and Southwest (SW). These sections of town come together around the U. S. Capitol, which marks the center of the city. Addresses in Washington, D.C. include a direction, which tells you which quadrant of the city the address is located in. You need to be careful because the same street name and number may exist in for example, NE as well as NW. There are many routes into and out of Washington, D.C. from the suburbs. The Capital Beltway surrounds the city passing through Prince George's County and Montgomery County in Maryland, and Fairfax County and the City of Alexandria in Virginia. 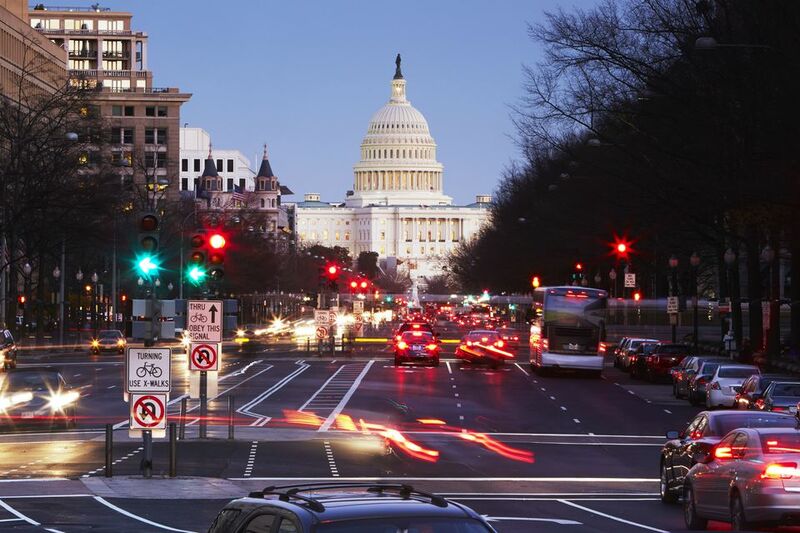 To learn about the major roads in the Washington, D.C. area, see An Overview of the Highways Around the Capital Region. Look at a map and plan your route before you venture out to a new place. Note, the traffic lights in the city are on the sides of the roads, rather than overhead. Be careful at the traffic circles throughout the city. You can easily end up on the wrong road, especially at night when signs may be hard to read. Obey stop signs and signals and look out for traffic cameras. Tickets may be mailed to you and can be outrageously high. Yield to pedestrians and bicyclists. Drive slowly in highly trafficked parts of the city, especially the areas near popular tourist attractions. The best way to get across town and to the suburbs of Maryland and Virginia is by Metro. The Washington Metropolitan Transit Authority is relatively clean and safe. To find the Metro stations, look for the tall brown columns with the large "M."
Metro opens at 5:30 a.m. on weekdays and 7 a.m. weekends. It closes at midnight Sunday through Thursday. On Friday and Saturday nights, it stays open until 3 a. m. Fares range in price from $1.35 to $4.25 based on the distance you travel. Unless you want to carry around lots of change, be sure to have plenty of $1 bills to buy your tickets. The ticket machines will give you change for 5, 10 or 20 dollar bills, but only in quarters. Transfers are free within the Metro. There are five different Metrorail lines that go around Washington, Maryland and Virginia. Plan your route and be sure to notice if you need to change lines to reach your destination. Washington, DC has a bus system to get around the National Mall. DC Circulator Buses provide an inexpensive way to get around the city's most popular attractions. Buses run every 5 to 10 minutes and will cost $1 per ride. Since some areas of town are a long walk from Metro stations, and DC Circulator buses do not run throughout the city, it may be easier to get to some places by Metrobus. Bus stops have red, white and blue signs or flags. As the bus approaches the stop, look for the route number and destination displayed above the windshield. Fares range from $1.25 to $3.10. DC Streetcars are making a comeback and returning to the city to provide additional transportation to gap areas that are not currently being served by other means of transportation. The streetcars are expected to begin service in 2013 and will be expanded in the coming years. Taxis are easy to find around Washington. To get around the downtown area, the fare will range from $4 to $15. Each passenger may be charged an addition $1.50. Car sharing provides self-service vehicles available by the hour or day. The price includes gas, insurance, and maintenance and you only pay for the time you use. This is a great alternative for an occasional trip to the suburbs. Long Term Parking in Washington, D.C.
Driving Times and Distances from Washington, D.C.
Disabled Access to Washington, D.C.